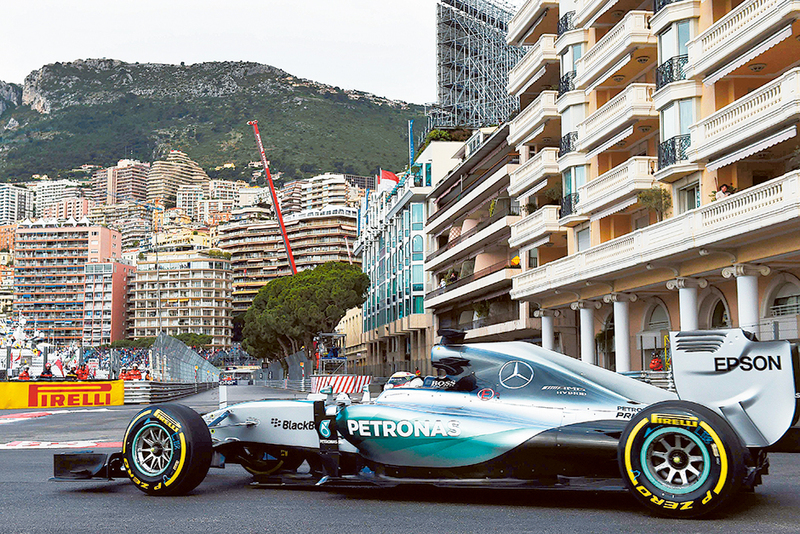 Monaco: Championship leader Lewis Hamilton celebrated signing his new deal with Mercedes by topping the times in Thursday’s opening free practice session for Sunday’s Monaco Grand Prix ahead of Dutch teenager Max Verstappen in a Toro Rosso. The two-time champion, who announced on Wednesday a three-year extension of his contract to 2018, celebrated that deal with a composed performance and a best lap time in one minute and 18.750 seconds. This left him 0.149 seconds ahead of Verstappen while his Mercedes teammate and championship rival German Nico Rosberg was ninth fastest. Rosberg, who won the Spanish Grand Prix earlier this month, trails Hamilton by 20 points in the title race and survived a “moment” at the Tabac corner when he “kissed” the barriers without damaging his car early in the 90-minutes session. Australian Daniel Ricciardo was third quickest for Red Bull ahead of four-time champion German Sebastian Vettel in his Ferrari and Spaniard Carlos Sainz in the second Toro Rosso. Venezuelan Pastor Maldonado was sixth for Lotus ahead of Russian Daniil Kvyat in the second Red Bull, Finn Kimi Raikkonen in the second Ferrari, Rosberg and Brazilian Felipe Massa who was 10th in the second Williams. The track was cool and slippery from the start of the session following overnight showers and the surface temperature climbed slowly from 16 to 21 degrees Celsius while the air temperature hovered around 14 degrees, very cool by local Monegasue standards. Sainz and Frenchman Romain Grosjean in a Lotus survived spins during a busy session that saw something of a recovery by the besieged McLaren team for which Briton Jenson Button who was delayed in his garage for the first 45 minutes. The most impressive run came from Verstappen who proved to any doubters that, aged just 17, he has all the talent and skills to impress and total confidence in his Toro Rosso car. Meanwhile, Mercedes director Niki Lauda said Hamilton deserves all the money he earns from his new three-year contract with Mercedes. Austrian Lauda, a three-time world champion, was closely involved in the negotiations that led to Wednesday’s confirmation of a deal that is widely reported to be worth more than 100 million dollars. His former McLaren teammate and fellow Briton Jenson Button, the 2009 world champion, said he had heard of the money that Hamilton may earn. “It’s amazing,” he said. Mercedes gave no details of the financial arrangements in their announcement Wednesday confirming the contract.